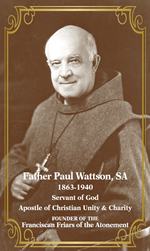 Father Paul Wattson, founder of the Franciscan Friars of the Atonement, had a long and deep devotion to Mary, Mother of Christ. Even before he was received into the Roman Catholic Church, Fr. Paul and Society of Atonement co-founder, Mother Lurana White, established the Rosary League of Our Lady of the Atonement. In 1903, he enclosed a pamphlet in the first issue of his publication, The Lamp, encouraging devotion to Our Lady by praying the Rosary. Later, this devotion led Father Paul to give the title "Our Lady of the Atonement" to the Blessed Mother. He felt that the Society of Atonement's goal to re-unify Christians could not be accomplished without the help of prayer and the intercession of Our Lady. He wrote an editorial in The Lamp in March of 1910, "God forbid that the Children of the Atonement should ever be strangers to the passion and crucifixion of Jesus Christ." He adds, "The very name Atonement is a perpetual reminder of the Cross. Our Lord hanging there in mortal agony; Our Lady standing by, the sword, foretold by Simeon, piercing her heart. This is the central scene in the mystery of the Atonement." Fr. Paul believed that her claim to this high title rests most solidly on the fact that she consented to become the Mother of the Redeemer and that she suffered with Jesus during the Passion. 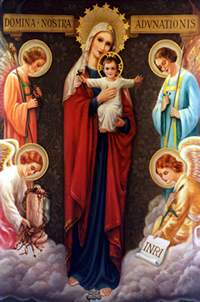 In the September 1932 issue of The Lamp, Father Paul wrote, "When we, therefore, give to our Blessed Mother the title of 'Our Lady of the Atonement', we mean 'Our Lady of Unity.'" 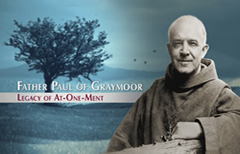 In 1919, Pope Benedict XV granted Father Paul's fervent appeal to bless the Atonement community by recognizing the Graymoor custom titling the Mother of Christ as Our Lady of the Atonement, and she was given a feast day of July 9. Father Paul composed a prayer to Our Lady of the Atonement which continues to be prayed by the Friars and Sisters of the Atonement today.